Enough for all, enough for ever, I think this is a good summing up of Guru’s teachings. God the Giver, who never stops giving, supplies the Universe with enough resources to last for as long as the Universe exists. If we narrow it down to the planet earth, it has enough resources to feed, clothe and house the billions of people that live on it in the 21st century. But the people who are living by the grace of God’s generous gifts are too greedy, consuming too much and polluting our beautiful and productive planet so that it will end up feeding fewer and will ultimately run out of resources. There are many examples of how we destroy the food sources given to us by the Creator. The demise of the dodo is a good illustration of how wasteful man is. The dodo was a flightless bird that lived on the island of Mauritius in the Indian Ocean. After the Europeans discovered the sea route to South and South-East Asia via the Cape of Good Hope (South Africa) it became one of the stops where the ships would take on fresh water, fruit and vegetable and anything else edible. And the dodos were edible. They were not afraid of humans and could not fly away, so many ended up in the cooking pots on board European merchantmen. You do not need to be a genius to work out that if you kill more birds than are born, you end up with a diminished number of birds, who produce less off-spring and soon enough you end up with no birds at all. The demise of the dodos was speeded up by the introduction by Europeans of pigs, dogs and rats, all of which developed a taste for dodo eggs. 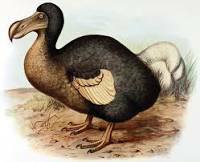 As far as I know the dodo was first described by Portuguese sailors around 1500 and became extinct in the late 17th century. You can put a lot of the blame on enterprising fellows from the Netherlands, who on their way to their settlements on Sri Lanka and in the ‘Dutch East Indies’, now Indonesia, caused a good bit of environmental damage. These days we are more subtle. We claim more and more land for cities, towns, motorways and agriculture, which leaves less land for the natural resources that our forefathers used to live on. We are steadily working on the pollution of the oceans, which could be an incredible rich source of food that could feed us for a long, long time if we treated it with more respect. We are also the masters of waste, in the rich western countries thirty percent of the food produced is thrown away. We grow soya which can easily be eaten by us, but we feed it to cattle and then eat the cattle. Not very efficient at all. Living in Hukam includes respect for the creation of which we are part. Nature is not something outside us, we are part of it. If nature dies, we will die with it. Abusing nature will be punished by death of all and everything on the planet. 452.The Man in Blue – Where are Sikhs in the caste society ? The answer to this question should be : nowhere. We should all be like people whose origins are outside the subcontinent and who have no position in the caste system at all. None of us should be Dhillons, Sandhus, Sharmas or whatever, there should only be Kaurs and Singhs in the Sikh Qaum. UK ‘main stream’ Gurdwaré are often dominated by Jats, Ramgarhia Gurdwaré are dominated by Sikhs who are known as ‘tarkhans’ (carpenters) and Ravi Das Gurdwaré are for people who belong to various jatis that are perceived to be of low caste. When Ramgarhia Ranjit Singh was appointed as Jathedar Akal Takhat by SGPC Pradhan Tohra, the Amrisaris talked as much about the fact that he was not a Jat as they talked about the alleged killing for which he had spent time in prison. Sikhs elders, but also some ‘orthodox’ Sikhs, are happy when Chinese, Russian, German or Dutch people become Sikhs, but a lot less happy when these ‘malech’ Sikhs start marrying ‘proper’ Sikh ladies. Can I remind everybody that the Sikh Rehat Maryada defines a Sikh according to her/his beliefs and not according to whom their father and mother are. Guru Nanak’s father was a Hindu, Sri Chand, Guru Nanak’s son, was a Hindu too. The Sikh ethnic category as defined by the UK Law Lords is linked to the fact that the majority of the Sikhs are from Panjab, but they are defined by their dharm, their way of life, which sets them apart from other Panjabis. Sikhs can leave the ethnic category by not living according to Guru’s teachings or join by starting to follow those teachings. The Law Lords also explicitly mention non-Panjabis joining the Sikh ethnic category. That does not stop some people to see the Sikh ethnic category as an excuse to make the Sikh Panth, Qaum or Nation a closed group, as if it is a biological category. Again this is not how my friend Ranjit Singh Vakil (CoK) described the Sikh Nation in his excellent paper on the subject. Just like the Dutch, the British or the Belgian Nations are not closed categories, the same should apply to the Sikhs. Whether we see ourselves as a nation, as a dharm or as a religion, we should welcome all comers. Sikhs are not into converting people, but everybody is welcome, regardless whether they are just looking for information or whether they want to become Khalsas. They should feel like being amongst sisters and brothers (as we are all members of one family). In the south of India is a group called the Lingayats. They practice Shaiva bhakti and were against caste, but have ended up as a caste themselves. I think that there is a serious risk that the Sikhs in India will end up in the same position ! Let us who live outside Bharat Mata make sure that we do not get caught in this trap.